SCHAUMBURG, IL (March 13, 2018) – Mondelēz, Kimberly-Clark and Unilever were among the most effective marketers at the 2018 North American Shopper Marketing Effie Awards, which were awarded tonight at the Path to Purchase Institute's Shopper Marketing Celebration. Geometry Global won a total of 10 Shopper Marketing Effies, by far the most of any agency in this year's competition. Mondelēz won 4 Shopper Marketing Effies, while Kimberly-Clark and Unilever closely followed with 3 Shopper Marketing Effie trophies apiece. Team Unilever Shopper and KC Shopper Connect won 3 Effies each, and TracyLocke and Integer Group were both awarded 2 Effie Awards. "Shopper Marketing Effie winning teams are known for leading the charge on insight, technology and creative path-to-purchase strategies that deliver results," said Mike McMahon, President & CEO, Path to Purchase Institute. The summation of total points earned by both this year’s winners and finalists will be factored into the Effie Index, which ranks the most effective advertisers, brands, holding companies and agencies in the world. North American Effie rankings will be announced at the Effie Awards Gala on May 31, 2018 in New York. 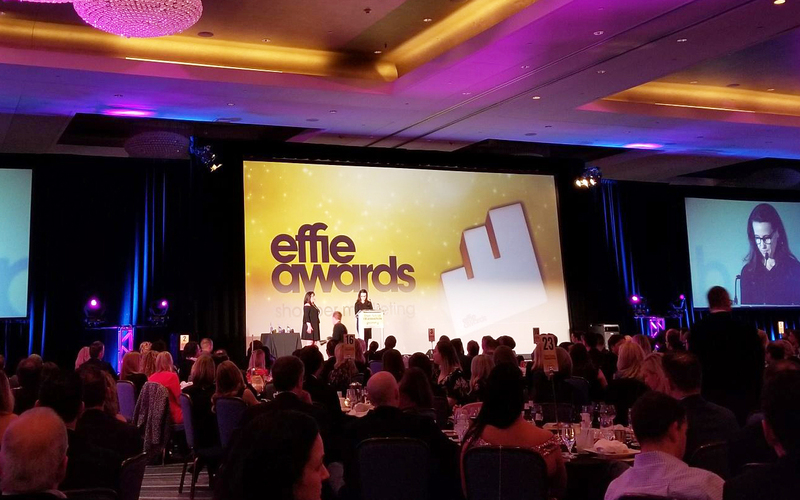 The complete listing of 2018 North American Shopper Marketing Effie winners is available for download on www.effie.org and follow below. Gold: Unilever, Team Unilever Shopper and Geometry Global for "AHOLD Feeding America Program - Hidden Camera on Hunger" with Mirum Shopper. Gold: Tyson Foods and IN Connected Marketing for "Sam's Club Halloween Multi-Brand Platform"
Bronze: Mondelēz International, Geometry Global (New York & Chicago) for RITZ Cracker's "RITZpiration"
Gold: Pfizer Consumer Healthcare and TracyLocke for Advil's "What Pain? All Gain"
Bronze: SC Johnson and TracyLocke for Glade's "Glade Plugins Car: New Product Launch"
Bronze: Unilever, Team Unilever Shopper and Geometry Global for Unilever brands Dove, Suave, Caress, Ponds, Tresemme and Degree, "Treat Yourself"
Silver: Roundy's/Metro Market and Cramer-Krasselt for "From Big Box to Food Boutiques"
Silver: Diageo North America and Mosaic Shopper for "The Diageo Whiskey 5"
The 2018 Shopper Marketing Effies are sponsored by Valassis Digital. Effie Worldwide is a 501 (c)(3) nonprofit organization that stands for effectiveness in marketing communications, spotlighting marketing ideas that work and encouraging thoughtful dialogue about the drivers of marketing effectiveness. The Effie network works with some of the top research and media organizations worldwide to bring its audience relevant and first-class insights into effective marketing strategy. The Effie Awards are known by advertisers and agencies globally as the pre-eminent award in the industry, and recognize any and all forms of marketing communication that contribute to a brand's success. Since 1968, winning an Effie has become a global symbol of achievement. Today, Effie celebrates effectiveness worldwide with the Global Effie, regional Asia Pacific, Euro, Latin American, North American and Middle East / North Africa Effie programs and more than 40 national Effie programs. For more details, visit www.effie.org. Follow @effieawards on Twitter for updates on Effie information, programs and news. The Effie Effectiveness Index identifies and ranks the marketing communications industry’s most effective agencies, advertisers, and brands by analyzing finalist and winner data from Effie Worldwide competitions.